Whimsical, bold, crafty, colorful—sounds more like a dreamy Wes Anderson film rather than a sartorial process. Morgan Abbey ’18, however, makes personal style into a cotton-candy world full of creativity, strong women, well-crafted projects and bold choices. I was honored to be let into her fascinating world of style. As I sit here listening to “Do you Realize” by the Flaming Lips, I am cognizant of the fact that I may be reducing Abbey to a manic pixie dream girl, which is certainly not my intention. On the other hand, this is a woman who wore a big pink tutu dotted with little lights to Winter Ball. It’s impossible not to paint Abbey with a bit of whimsy. And Abbey’s makeup choices are anything but neutral. 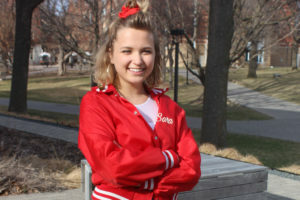 Makeup functions as a metonym for Abbey’s style, allowing her to be “bold, unique and fun.” If you’ve seen Abbey around campus, you’ll know that she doesn’t shy away from color. Her makeup is no different. She’s a chameleon, sporting eye shadow and liner in every color imaginable. According to Abbey, the process involves a shower brainstorming session, followed by 20 to 45 minutes of application. This happens every day, and if it seems like a hassle to those of you with an aversion to makeup, rest-assured that it is Abbey’s favorite part of the day. For her, it’s like painting, and she gushes, “I have pallets in every color imaginable, lots of different brushes, I’m blending, I’m pairing two colors together, I’m doing intricate lines with eyeliner. I like to paint too, but makeup is my preferred medium since I get to wear it all day.” While the confidence required to pull off such a bold look may seem impossible to some, Abbey assures us that she was also wary to make this signature look a daily fixture of her visual presence on campus. Abbey muses, “I was worried about the colors not being ‘wearable’ when I first wanted to start wearing a lot, but if you just wear something, it becomes wearable.” Abbey explains how comfort and ease come with time, and if you do it enough, it begins to feel normal. Growing up in rural Missouri, Abbey hasn’t always been a bold dresser, although she’s loved skirts and dresses since her kindergarten days. In seventh grade, she cops to the fact that she went through a self-described “‘I have to fit in’ phase,” but that phase ended in high school, when she won “most unique style,” distinct from the “best style” category, which Abbey found hilarious. Her unique style is a way to put her creativity on display, since she explains that her personality is pretty serious. In Abbey’s words, “I’m definitely outgoing, but I’m also a little bit reserved—I’m never the goofy, funny one in a group. My clothes allow me to show the fun and silly side of myself and help counter the more intense parts of my personality.” Her clothes definitely show this, especially her recent creation for Winter Ball. As I mentioned, Abbey dreamed up a romantic fairy ensemble for this year’s Winter Ball, complete with twinkling lights. 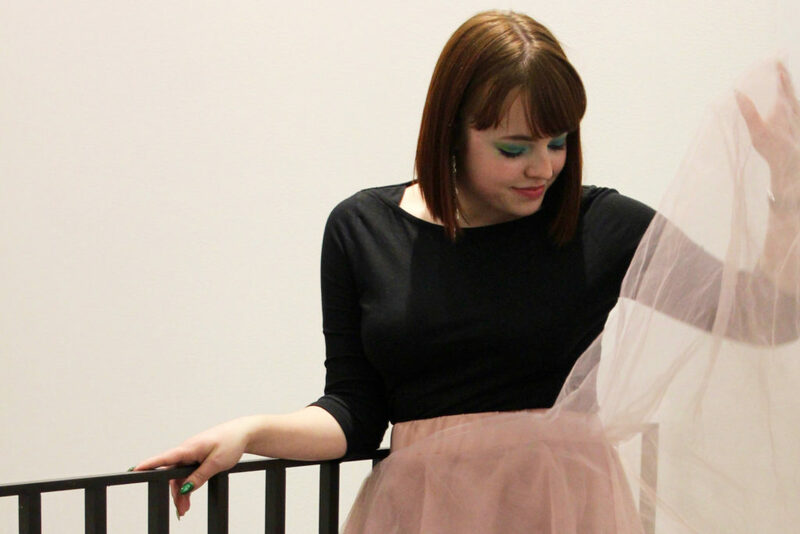 Abbey’s process for the creation of this ensemble is emblematic of her hands-on approach to style. She begins planning a few weeks in advance of every big event, and “an idea will usually just come to me and then I figure out how to execute it.” Abbey describes how her process involves “hot gluing, pinning and trips to Michael’s.” This DIY approach is inspiring in an age plagued by the fast-fashion model of shoddily-crafted trendy clothing that quickly falls apart. Abbey’s creative expression comes from two of the most important people in her life, her mom and her grandma. Both women “live these artistic lives where anything can be turned into a project.” In different ways, they both taught her “to bring a creative eye to everything.” To Abbey, “clothes are another form of art that I get to be really playful with and get a lot of joy from.” Her mom, a scientist, “does all the research, all the planning, pays attention to every single detail. She literally has a microscope that she uses all the time to make sure everything is perfect.” However, her mom’s also successfully taught herself to “sew, paint, draw and work with metal.” Morgan’s grandma, on the other hand, uses a slightly different lens for her creative projects. Abbey describes how, “My grandma would buy these really old cheap trucks and paint all sorts of cool stuff on them. She covered her fireplace in river rocks and mushrooms instead of tile or brick. She drilled poems into her hardwood floors.” It’s clear that Abbey’s artistic process stems from the detail-oriented, do-it-yourself and self-reliant traits passed down from her mom and grandma. Abbey’s reverence for her mom’s creative abilities extends into the future, as Abbey half-jokingly talked about how she told her mom that she would “pay her to be my in-home designer so she can help me sew and craft all my weird clothes.” The “weird clothes” she is referencing are part of her future wardrobe as an elementary school teacher. Abbey hopes to channel Mrs. Frizzle of the Magic School Bus, and to “show up to work in an amoeba skirt or solar system headband or whatever. I’m super excited about this!” Abbey’s future style plans shouldn’t surprise anyone. 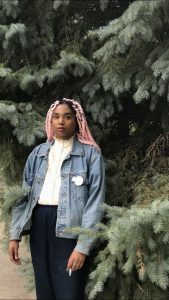 Abbey’s quirky take on the style process leads her to offer us some classic style advice from a fresh perspective.“You know those old ladies in New York City who wear super outlandish clothing but they’re like the style icons of the city? Everyone thinks they’re super fashion -forward but really they’re just wearing weird, creative stuff and people love it because it’s different.” She follows up with some advice: “Wear whatever you can think of, whatever makes you happy. Even if it’s weird, wild, different from what everyone else is wearing—if you wear it proudly you’ll look fantastic.” Abbey has found inspiration in art, her family and Mrs. Frizzle. Now, she implores us to do what makes us happy, find our inspirations and to strive to stand out. For Abbey, bold is best.